February is quite a smelly time for us here in Knoxville and all throughout Tennessee. You see, February is skunk mating season, which means the presence — and the stinky odor — of skunks is much more prevalent this time of year and lasts into the spring. The trouble with skunks and other wildlife is, once they show up, they don’t usually go away on their own, which can be troublesome for residents, their families, and their pets. As Knoxville’s Top Rated Local® wildlife removal experts, our team is experienced in dealing with skunks and can safely remove them from your property using humane trapping and removal techniques. If you have a skunk problem, we have the best solution. Call Critter Wranglers to schedule a skunk removal. In the meantime, here are some tips and tricks you should know to help protect your family and your home from the smelliest of critters. The most common species of skunk in Tennessee is the Striped Skunk, which is found in all areas across the state. When compared to the Eastern Spotted Skunk, the Striped Skunk’s musky scent isn’t quite as strong, but is just as unpleasant as any skunk’s. They are medium-sized mammals with small heads, stout bodies, stubby legs, and characteristically bushy tails. Striped Skunks have long, black fur with a white stripe on their head that forks into two stripes that run along the sides of the back. Striped skunks typically have a white stripe running down their snout. Beginning in mid-to-late February, you’ll start to notice s stronger, more pungent smell in the air. The unpleasant, musky smell is a telltale sign that skunks are in the area and that breeding season has begun. During skunk mating season, their awful scent tends to linger in the air for days or even weeks at a time, penetrating the interiors of homes and businesses across the state. This can make spending time outdoors difficult to enjoy. Skunks are attracted to HVAC units, which are easy for them to get into, and which provide them a place to stay warm and hidden during mating season. Skunks also prefer to mate and hunker down under decks and under homes, which provide them with similar amenities to the underground dens they build in forests and bushy fields. Small holes in the yard give skunks easy access for setting up an underground den where they can mate, gestate, and have their litter. If you have a skunk problem, you want a quick, effective solution. Ignoring a skunk problem will only allow it to get worse, so it is essential to take care of these critters right away. Your best bet is to call Critter Wranglers, Knoxville’s Top Rated Local® wildlife removal team. We have decades of experience removing these stinky critters from homes and businesses and we do so with haste in a safe, cautious, humane manner. 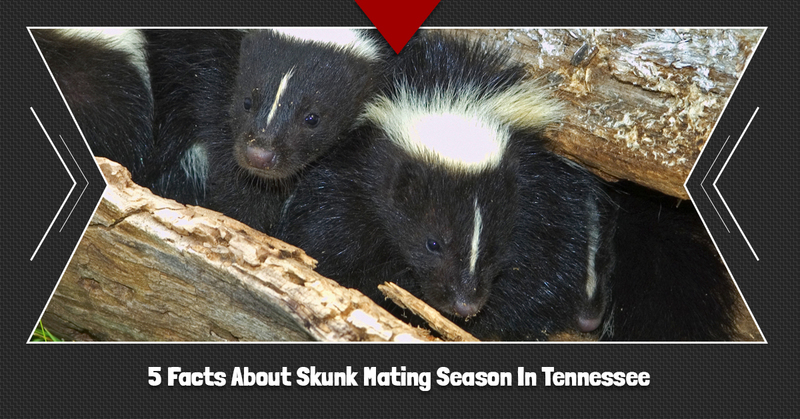 Whether you’re in Knoxville, Powell, Maryville, Alcoa, Friendsville, Louisville, Rockford, or Seymour, skunks in Tennessee are rampant this time of year. Contact Critter Wranglers to handle a skunk removal and wildlife removal.